This is my first post with pictures, so let's see if I can make it work! Anyway, I just finiished my largest twined piece yet... It's a rug, 30" x 4ft. 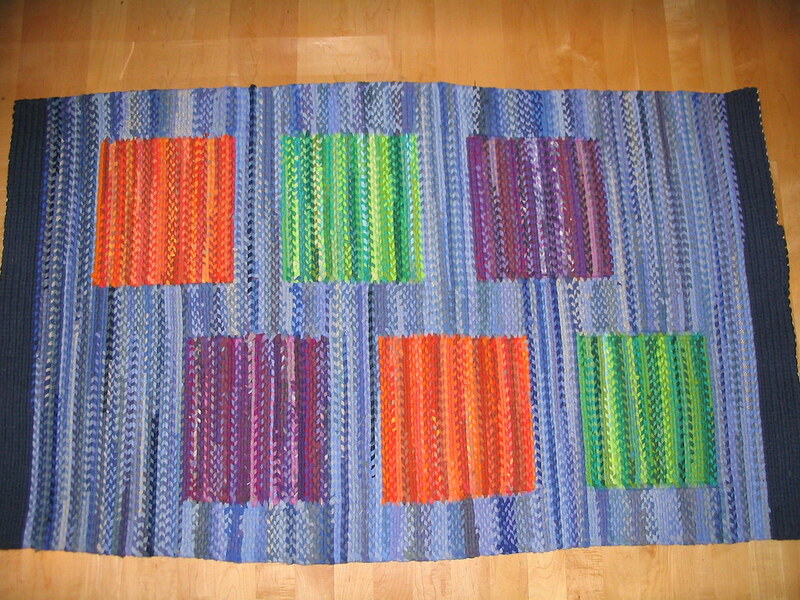 I wove it on a tapestry loom using T-Shirts from the Goodwill bins. 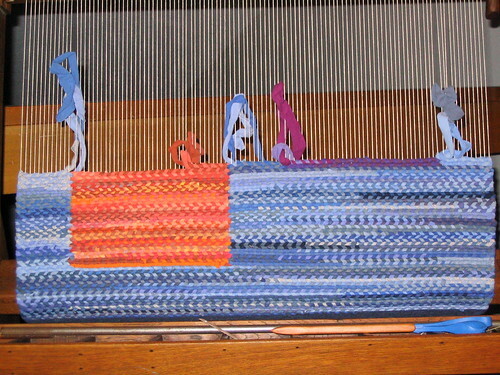 The tapestry loom is a vertical 30in wide loom. This was the first time I tried twining, with a tapestry style technique to weave blocks of color. And finally, here is the finished rug. The photo I took distorts the image a bit...The edges are straighter than the picture shows. Instead of leaving a fringe, I wove the ends back into the rug. I think it turned out pretty well, for a first time larger effort. The colors shown in the pictures are pretty accurate. I actually got the idea of twining rugs using t-shirts after watching my Mom crochet rugs... Then I started making rugs with a "Knifty-Knitter", and then I decided to move to twining using a real loom. I am amazed at the colors that are available using t-shirts! This is awesome! It makes me want to get my own loom. I've always wanted a loom! I think this is fantastic and it looks like it would be so much fun to do! That is gorgeous! I am so impressed with your idea to use old t-shirts! I need to stop visiting the weaving board. Weaving envy!! LOVE IT! Does it take a long time to do that? My only experience with anything near that is a little 8 inch square loom we used to make potholders on when we were little tykes. Did you make the frame too? This is totally amazing! I love the colours! Wisted! That is really cool! I love the colors and the use of shirts. Great idea. Absolutely wonderful! 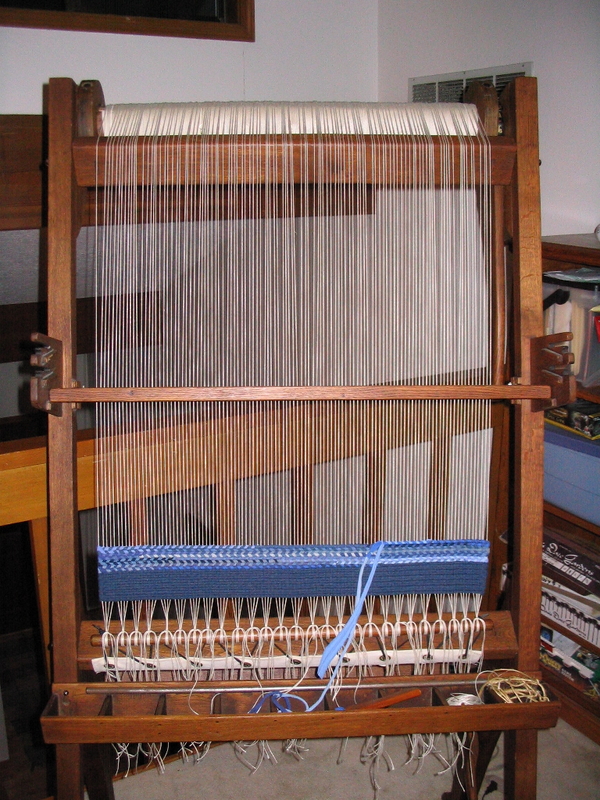 I love your loom; it is so pretty! I was wondering how you weave different colors on a row. Do they just go back and forth and not connect or do you loop them together when you change from one color to the next? So neat! I heard a lady speak at my weavers guild recently about twined rugs but they were all big and heavy- this one looks so light! How wide didi you cut the strips? Another use for old tee shirts- how great! !